Posted by Laura Arnold in Indiana Michigan Power Company (I&M), Net Metering, Uncategorized. Click this link for video from WNDU Channel 16 > Hydroelectric turbine saving South Bend on electric costs. Better late than never, a hydroelectric turbine purchased in the early 80’s, was finally installed in Downtown South Bend. Now this new installation will soon be saving money for the city. After sitting since 1983, in a warehouse, this bright blue turbine has found it’s home. The turbine was installed along the fish ladder in Seitz Park, while it is in place there is still a good deal of work that must be done. While some of the bugs have slowed the project, some have actually been a good thing. That power will be put to good use in Howard Park, powering the Human Rights Building, the ice rink, the rec center and even the lights along the East Race and there will still be some left over. That agreement will allow the city to use every drop of energy and stack up some serious savings. “That is worth about $40,000 a year to the city,” explains Burke. So you might be wondering what this cost the city. Total installation costs were around $268,000. A federal grant covered all but $26,000; a cost that John says will be recouped in six to seven months from the use of the turbine. 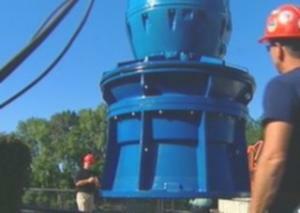 More hydroelectric potential for South Bend < Click this link to view another WNDU video. A hydroelectric turbine purchased in the 1980s has finally been installed in Setiz Park and will soon be cranking out energy savings of around $40,000 a year for the city. That might just be the tip of the iceberg for hydroelectric power in South Bend. Step two is a little larger and like the original turbine it was started back in the early 80s. “Around the same time the Fish Ladder was built the city had the foresight to secure and exemption from the federal energy regulatory commission that allows the city to build a 1.7 megawatt unit, right here along the Seitz Park area,” explains Burke. That is about 27 times larger than the recently installed unit, and the means a lot more power. As for the price tag of making it power multiple buildings. Original plans for the project place the facility over Setiz Park. Burke says they would remove the park, and then rebuild the park on top of the turbines. While a majority of the facility would be underground, the original plans did call for a walkway that would allow the public to view the turbines on one side and the Fish Ladder on the other side.